I've liked photographing contrasting architechture ever since High School. That's cool - I ♥ the contrast! Wow! I agree with the above comment. I'd love to have that hanging in my house. Since moving to NY I have been noticing architecture more. I love how the way wildly different styles are squashed right next to each other. I think it's one of my favorite things about the city. 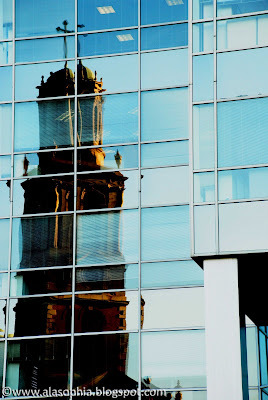 Also, I love the way you captured an older looking church in the reflection of an obviously very modern building--it's almost like a metaphor of the new reflecting the old, or something like that.